The title says it all really. 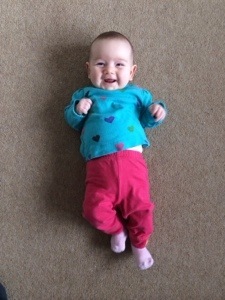 This little bundle of smiles is three whole months old today! 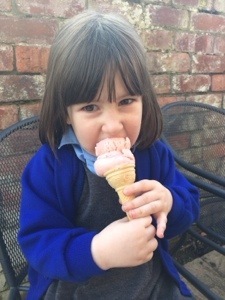 Her big sister still delights in telling people that C is ‘zero’, but she was more than happy to go out in the sun and celebrate after school today with an ice cream from our local sweet shop. Pink flavour, of course. 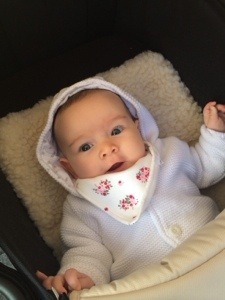 And C herself celebrated in her own style – a nice long morning nap in her pram, copious amounts of milk, a generous sick up over mummy’s shoulder and then tucked up in bed by 830pm. Time now for me to celebrate in my own way too – a hot chocolate with a cheeky dash of Kahlua, my knitting and Great British Sewing Bee recorded on the TV.